Do you love local businesses? Do you love food? Do you love food on wheels? Then this is the success story you’ve been waiting for! Kara and Nevin Fenske have both worked in the hospitality business for as long as they can remember. Kara thinks this is what drove them to start their own business. The married couple had maxed out their creativity working for other people, and it was time to be their own bosses. When they came to Business Link in 2010, their intention was to open a restaurant. Things didn’t work out for them at the time, but they came back in early 2011 with a much more solid and ambitious plan: to open a food truck. Food trucks had become a “thing” in the United States, but in Edmonton food trucks were a rare sight, usually only popping up at festivals or farmers’ markets. Kara and Nevin envisioned something different: they wanted their food truck to be a full-time proposition. Of course, this meant that advice from industry veterans was non-existent—food trucks were so new in Edmonton, they couldn’t find any natural mentorship. So, Kara called Business Link. They dove in headfirst and created a business plan using Business Link’s market research services. 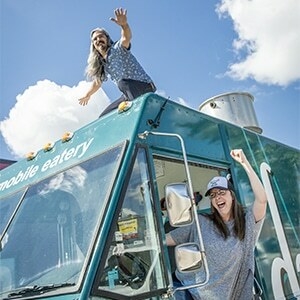 They were eager to start right away and opened their business, Drift Food Truck & Eatery, inside Drifty, their truck, as soon as they possibly could. Unfortunately, this meant opening midway through the summer, losing valuable months of experience and income. Kara says they weren’t ready for that first winter. When October came, they said to each other, “What should we do? Should we get jobs? Should we cater?” They felt that their biggest challenge would be retaining the customer base they’d secured that first summer. Would Edmontonians remember them the next May? Business Link suggested they get started by becoming active on social media. After taking classes on how to use Twitter and her (brand-new and first-ever cellphone) iPhone, Kara took the Drift brand to Twitter where people like me found them and have been loyal customers ever since. However, they opened and closed the restaurant within one year, despite enjoying rave reviews. The couple soon learned that with a small child at home, running two businesses together wasn’t the right fit for their family. They worried that they were sacrificing revenue from the food truck, and made the decision to close the restaurant. The food truck scene in Edmonton was changing by then, too. 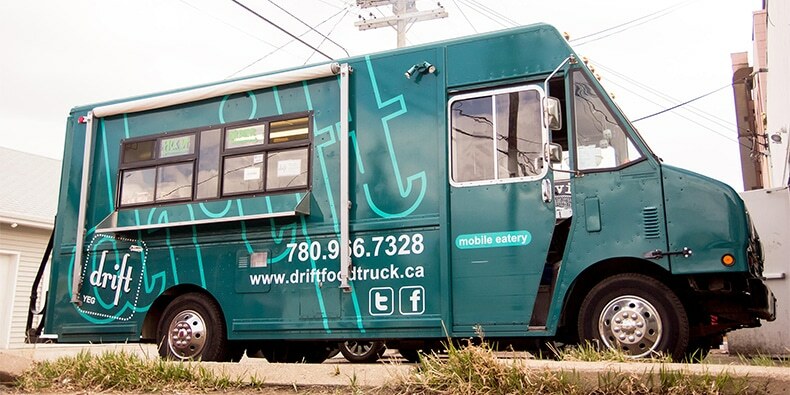 Whether the sudden growth of food trucks in Edmonton was inspired by Drift’s success or not, the industry quickly became saturated, resulting in decreased business. However, as quickly as new trucks popped up, they shut down just as fast, which meant a further shift to Drift’s business strategy was needed. With all the challenges Kara and Nevin faced as their family, business, and city grew, they found two things remained constant: every spring, they worried whether they would gather momentum again, and every winter, they wondered what to do with themselves. This past year, that changed. The pair secured a contract to operate the concession at Shamrock Curling Club and have partnered with Plaza Bowling on their menu. Now, they feel more financially secure, and are far less worried about losing brand momentum over the winter. Now that they’re more secure, what does their future hold? Well, they’ve hired a consulting firm to work with them so they can figure out how to continue to grow without sacrificing the things that are important to them. Kara does know one thing for certain: they’re not going to try another restaurant. As difficult as it was to give up on what had been their dream, she and Nevin both know it was the right decision for their family, and they have no regrets. Rebecca Calder is Business Link's Marketing Coordinator. Rebecca likes bears, beets, and Battlestar Galactica, though while completing her MA in Communications and Technology at the University of Alberta, she wrote two papers on Star Trek. Rebecca's interesting take on communications stems in part from her background in education. She worked as a substitute teacher for two years after completing her BEd, then realised that the classroom is not the optimal environment for an introvert. Today, she relishes the power she holds sitting behind a computer, able to talk with people all over the world. For now, she's using that power for good at her role in Business Link.